Win Tickets To Bill Bailey’s “Dandelion Mind” at Skirball Center Tonight! Featuring Bill’s trademark musical interludes, observations and stories of the road, Dandelion Mind will be based loosely on the theme of doubt (or will it? ), as we follow Bill from his real-life saga of being trapped by the ash cloud, to his barely contained rants about celebrity, TV, creationism and Michael Winner. He demonstrates new instruments, both ancient and modern, he sings an internet love song, a lament about punk heroes, Iranian hip-hop, and plays a mean folk-bouzouki. Thomas the Doubter gets a new look, and Darwin’s curious obsessions and the myth of intelligent design are all worked over in Bailey’s own surreal style. If that description sounds interesting to you, then you’ll probably be happy to hear that I’m giving away a pair of tickets to tonight’s performance of Dandelion Mind at the Skirball Center at NYU. The contest winner will be notified no later than 3PM today (Thursday, September 15), locals only please. If you’re not fortunate enough to win tickets tonight, you’ve still got two more chances to catch Bill at the Skirball Center on September 16 and 17 (Buy Tickets). 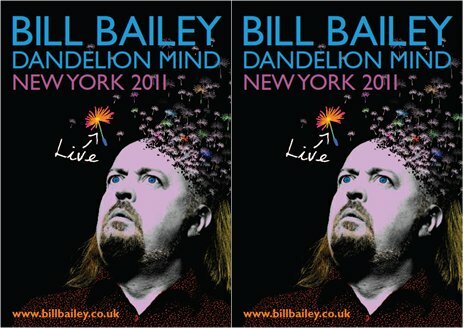 More US tour dates and Bill Bailey Dandelion Mind contest entry form after the jump.